Dreaming about hot summer days when we spend more time outside than in and you’re already thinking to create an outdoor room or to makeover your old design one? This time we suggest you 10 design ideas where color is the primary emphasis in the outdoor space design. Color is a means of expression, communication and projection of our inner tendencies and impulses, feelings and attitudes of our own personality structure. It has the ability to instantly freshen a place which is intented to offer you moments of relaxation. 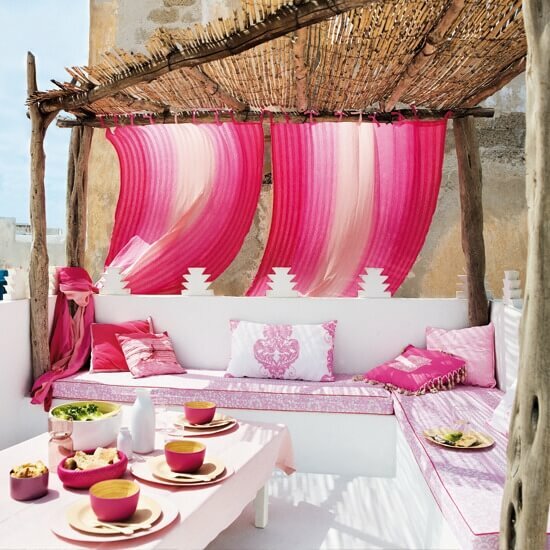 If you like bold colors than you’ll certainly love these colorful outdoor spaces showcasing amazing and refreshing color combinations. Be creative and do not afraid to use a wider range of colors, but make sure they match together so the final appearance should not be overwhelming. See some appealing designs for this summer. Wow! I love the designs! Such colors bring a simple conversation to life. I personally prefer photo #3. It has the relaxing spa atmosphere that I have always dreamed of. I adore the plain orange and blue hues. Since I am not a huge fan of patterned styles, I can say photo #3 is the best. Such art gives me a warm and inviting feel after a long day at work. Thanks a lot for sharing a wonderful collection!